Vintage Garden Spa is a quirky, boutique home based day spa with a beautifully designed vintage log cabin and hydrotherapy hot tub based in Ossett, West Yorkshire and easily accessed from the M1 motorway. Ossett sits between Wakefield and Leeds within the famous Rhubarb Triangle. Created in late 2016 by Sam, who wanted to create something locally that was special and unique where clients wanting a personalised approach to holistic treatments could visit. The spa creates a little haven where you can come and relax, without feeling pressured or rushed and our clients often say it’s ‘like being in a world away’. We offer a variety of holistic treatments and day spa packages with hydrotherapy hot tub and ‘homemade’ afternoon tea’s – which Sam bakes herself. We are also able to create bespoke packages so we are able to flexibly meet your needs. Please feel free to browse our SERVICES page to see what we have to offer you. Our hydrotherapy hot tub is located on a large decking area to the rear of our vintage inspired log cabin and is private with a beautiful clematis covered pergola. The garden area, which is lovingly tended with an array of baskets, flowering shrubs and stunning flowers is also available for your use when the weather is pleasant. We also have a large patio table and umbrella with comfy seating, where you can relax and take your afternoon if you wish. We also have another room available for use occasionally in the main house, which is decorated in a garden style to keep with theme of Vintage Garden Spa and this has a lovely calming zen feel to it with low lit candles and a stunning flowered wall mural. Please see our GALLERY for photos of our space. We like to be different and the spa is constantly growing due to the popularity of our warm, personal and welcoming approach. We have many repeat clients who love to come and take time out and who now feel Vintage Garden Spa has a special place in their hearts. All our reviews are 5* and we are incredibly proud to have achieved such lovely feedback from each and every one of our clients – you are the most important people in the world to us and our mission to go above and beyond to ensure you are not just satisfied when you leave but that you feel happy with the ‘oh my gosh that was amazing’ kind of feeling ! September this year saw Sam become a team, with the wonderful addition of Becci who is Sam’s daughter-in-law, but first and foremost they are the very closest of friends. Becci loved what Sam had created and wanted a job she loved and to be able to work with clients in a way that felt was the best for them. Becci has spent the past year training in a number of holistic therapies while working as a registered nurse in the NHS. Our clients comfort and happiness is of the utmost importance, and a great deal has been invested to ensure we achieve this – not just financially but Sam has the the keenest eye for attention to detail and believes it’s the little things that often matter the most. It has definitely been a journey of passion and love that has lead to the spa being what it is today. We want your visit to be hassle free and easy to plan and most of all we want you to be relaxed and excited about your visit from the moment you book to the minute you leave. When you visit for one of our day spa packages you will have the entire log cabin and garden area exclusively to yourselves. Our log cabin has a lovely inviting homely feel to it and Sam has taken extra care to create a beautiful, calming retreat. A pair of comfy wing chairs in the cabin with footstools so you can really ‘put your feet up’ and relax. We also have hug rugs so you can snuggle up in our chairs and even have a nap if you like ! Our cabin has underfloor heating to keep those toes cosy and warm. Sturdy and very thickly padded, heated therapy couches, our couches really are like ‘laying on a bed’. Our clients absolutely love how comfortable they are. A specialised memory foam cushion for the top of our couches to support delicate breast tissue when laid on your front – we know how uncomfortable it can be trying to lay on a hard couch and get those girls comfy ! Our cushion is also fantastic for pregnancy massage and also supports the shoulders when laid on your back. We have adult colouring books, magazines, crosswords and some music, film and trivia quizzes in the cabin or you can choose to listen to the ambient sounds of our background music while you have a good old catch up. We have a complete online booking system so you can easily check the date you want and pay a small deposit online. Our website holds a Commodo SSL security certificate so you can be sure that your payment is protected through our payment processor. We take card payments, bank transfer and cash for the balance on your booking, so you can choose whichever is easier for you. Our aim was to create an environment to capture the essence of a quaint, often forgotten feel of older times. An era when taking time for tea and rest was important. However, the best way to experience everything Vintage Garden Spa has to offer is to come and visit and see for yourselves ! We very much look forward to being able to welcome you and if you have any queries at all please get in touch. You can also visit our FAQ page for further details. Sam is the owner and main therapist at Vintage Garden Spa. Working previously as a mental health nurse in the NHS for over 15 years, Sam has extensive experience in supporting and caring for members of the public. After turning 40, she decided to change career and run her own therapy business. Something she had wanted to do for a long time and is incredibly passionate about. Sam is fully qualified and insured and has also been approved by the Environmental Health Department to enable her to provide food services at Vintage Garden Spa. Her recent hygiene inspection found her practice to be of a high standard – resulting in an official 5* hygiene rating award. Sam is married to Mark and they live with their 7 year old pooch Matilda, a Mini Schnauzer – who enjoys lazing in the lounge after a long morning walk and sleeping for much of the day ! She does enjoy popping out now and again to meet clients in the garden, however if you prefer not to be around dogs then she’ll happily continue her snoozing and won’t bother you. Enjoying a number of hobbies from crafting, to a keen interest in fantasy literature Sam’s favourite hobby is paper cutting and a few of her papercuts can be seen adorning the walls of the cabin. Sam also loves to papercut gift cards, which are offered to clients when purchasing vouchers as part of the overall spa experience offered. Sam is incredibly family orientated and loves to spend time with our ever growing family – she of course also loves cooking for everyone and her family feasts are quite the family tradition. Becci joined Vintage Garden Spa in September 2018, previously she has spent the past several years working as a general nurse in the NHS. Becci has supported Sam with the spa from very beginning and has loved seeing it go from strength to strength. She soon realised that Sam had hit a point where an extra pair of hands was needed and Sam wanted to offer clients longer treatments on her day spa packages. Becci had always loved the idea of working alongside Sam and being able to work with clients in a way that meets their needs in a holistic way, so she decided to train in holistic therapies and join the team. Becci currently works part time in the spa and spends the rest of her time with her beautiful family. Becci and her husband have 3 beautiful children – their youngest being just 4 months old. 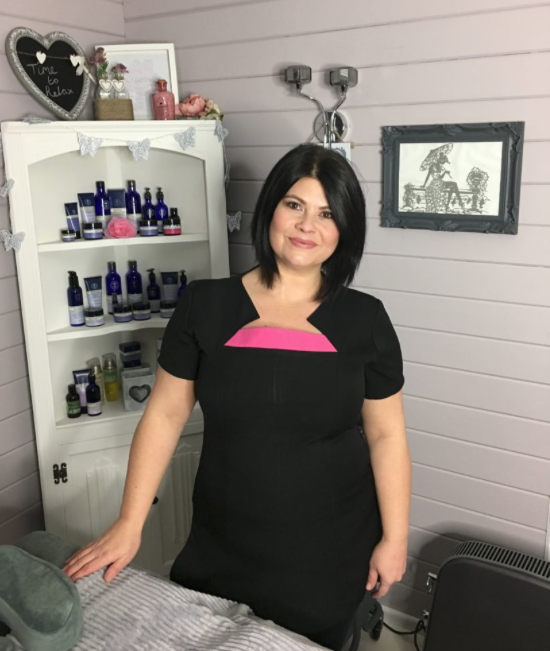 Becci specialises in pregnancy massage (among other therapies) and after recently being pregnant can fully appreciated just how long 9 months can be ! She also understands the needs of Mum’s-to-be and how pregnancy can have a huge impact, not just physically but emotionally and psychologically. Becci is a beautiful soul, with a wonderfully calming and nurturing nature and will put you at ease from the moment you meet her. We look forward to welcoming you at Vintage Garden Spa !